Discussion in 'Tuning Techniques and Tool Information' started by Tom K., Dec 18, 2017. My kind of crappy vise just bit the dust. Though far from perfect, it knew my foibles well, and tolerated me quietly for well over a decade. Also, it was a cheap date. So, Essay Test for Pugski Tuning Maestros: Declare your favorite waxing/tuning vise, and describe why in 100 words or less. Photos optional. Penmanship will not count. No videos. Ha ha! No video links counts me out. Most are good that have two ends and a center vice, but it's how you use them. Take care now. 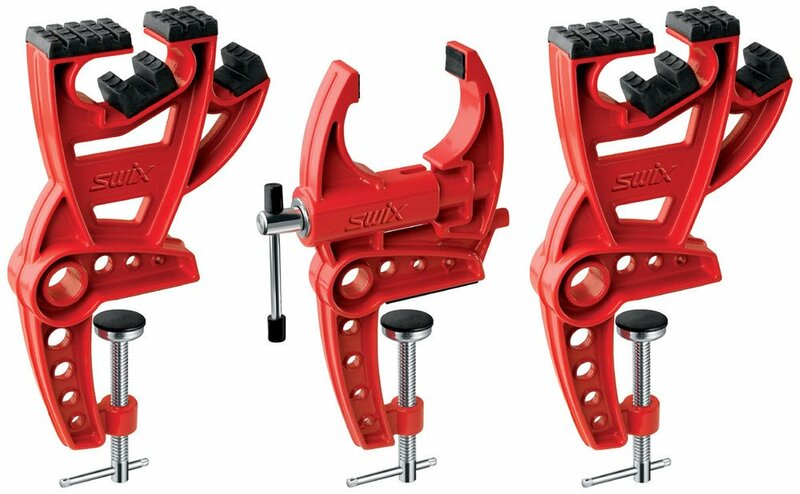 But you can buy the Swix World Cup vise for just $147 on amazon (and I wish I had). 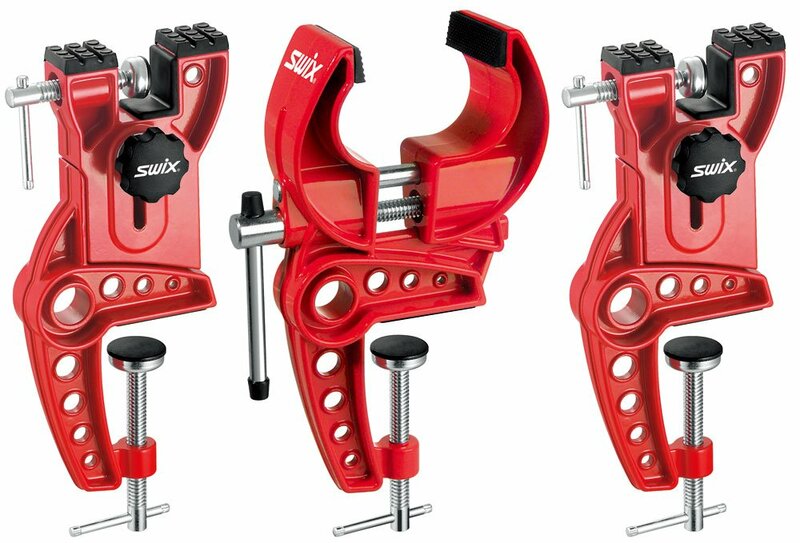 I have the Swix Jaw Economy Vise, which is just fine for a little less, $119.98. skiwhmts, hbear and Tom K. like this. They fit in my toolbox and securely hold every ski I've put in them. Have attached them from everything to a truck tailgate to a kitchen counter to an actual tuning table. And they're red which makes them better than others that are exactly the same. Big J and Tom K. like this. I make do by grabbing the binding, not the ski. I think there are a number of "brands" that are all really the same vise. Jacques, Blue Streak and Tom K. like this. The vises open symmetrically from center and are also useful for lots of tasks aside from ski and snowboard work. The 'Vise Wings' I made have plenty of friction on the tops and a pair of skis can be laid flat and worked on at once without clamping. It is way more efficient than old school clamping. Plus, when you add heat to the skis while waxing, the camber relaxes, letting the skis float makes more sense to me than keeping them clamped and flexed. Get PugSki stickers by indicating you are a PugSkier Supporter in your order notes. What I really want is something that is easy to mount ~8" in from the edge of my workbench. This keeps all the wax drippings and scrapings on the bench, and off the floor, which is great. Not a deal killer, but a guy can dream! SwiX WC, Toko WC, Ski Man I think are all the same vices in different colours. Great vices and pretty much stock for most techs. BGreen and Sibhusky like this. Basically all World cup models are same regardless if it's Swix, Toko, Holmenkol... They work good, they last forever and when you split money you will pay for them over their lifetime, they cost lest then coffee/year Personally I have Swix World cup vise and they are still from the time I was in world cup business, which means they are probably older then some of Pugski members, and still look pretty much like new. The WC Pro may be the Freeride in Toko's line. SkiMan makes vises and lots of tuning tools for the various ski and snowboard wax companies, Toko, Briko-Maplus, Swix, Holmenkol, The WC vise being just one flavor, painted different colors. So it gets down to color, brand loyalty, but some vises and tools do have minor differences specific to a brand. I'm not sure on Fk-SKS Kunzman vises. Tools4Boards makes their own and used to make vises for Swix (Cinch, Cordloc, Pro500, etc). Daves not here and Sibhusky like this. I use home made wood "vices". I use real vices at a retail store, until I make new wood ones. Anybody know anything about the Eggbar system (other than it's expensive)? It looks intriguing. Of the more classic style vises, right now I gotta say that @Jacques favorite Beast looks very good. Though I may have hurt his feelings by specifying "no videos". I have one like that that I use with a Workmate, because I don't have room for a real bench. Rubber mesh shelf liner from Home Depot probably makes more friction than smooth rubber. I think it's way better than a vise, but you'll probably want a center vice if you need to flatten or structure the base. I like the Eggbar, and I could probably fabricate a similar holding system on a workbench. Every time I buy a vise, it works great until the next pair of skis is too wide or the sidewalls are some weird shape or the bindings or too tall or something. My vice is the Jaws of the Beast from Beast tuning tools. $109. I like the way it works, it grabs the binding and adjusts up to tip and tail but I needed extra clamps to get it to fit my bench (wider) and it's fairly plasticky. So it doesn't really live up to it's name. Furry Little Rabbit would have been a better name. I wish I'd sprung for a sturdier vice. They were $89 Amazon, came in 2 days and work great. I've used the eggbar vice (the round race model) and liked it some. PROS: The on edge grip took getting used to and isn't something I use a lot so didn't get the hang of it. The grippiness of the platform was excellent. The ease of attachment to the bench (no strong arm required) was nice. CONS: the race model doesn't hold two skis at a time and in my production environment, skis side by side makes work quicker and easier. I simply swap skis left and right without having to move them off the bench. I'm waiting for Ace to send me a shop model that is reportedly quite nice, two skis/one snowboard wide and with an easy to adjust length between the stands. I use an old set of Swix vises. Narrow so not optimal for fat skis. Despite the center clamp, wide skis wobble as the clamp often won't hold the non-vertical sidewalls. The 2x4 arrangement on top of the bench holds the second ski while working on the first. Time and space dictate that I not move the ski not being worked on around to a wall or rack, but rather just swap them. The tray is held on by the vise clamps. Just mount vises on the bench with clamps loose, slide the tray in place and clamp the additional cross pieces to span the slots and permit the clamps a tight grip on the bench. skiwhmts, Blue Streak, Big J and 2 others like this. Thanks. The tray is simply luan plywood with a piece of lumber on one edge to stiffen it up and create a lip. Since employing it I haven't had more than a drop or two of wax on the floor and almost no scrapings. Tom K. and BGreen like this. Until recently Skiman was the only company making die cast aluminium ski vices, but recently the Chinese have entered the market. The one pictured in focker’s post is made in China and sold under several brand names, you can pick them up for $72 https://www.aliexpress.com/item/alpine-ski-vise/32464334394.html They have also started making irons, file guides and wax brushes. Is this the sort of setup you were thinking of Tom K.? 1. A cheap (now cracked) plastic center vise that holds modern skis modestly well at best. I just put assorted wooden blocks under the tips and tails of skis during waxing, which works OK, again, at best. The great thing is that the cheap old vise mounts 6 inches in from the edge of the bench, completely eliminating wax dripping. The second great thing is that when I'm not waxing, the wooden blocks disappear in a second, leaving my bench all but clear of ski-related crap, so it can revert to bike duty quickly. 2. Then on the edge of the bench, I've have easy on/off Swix vises for edge work, which I'm perfectly happy with. 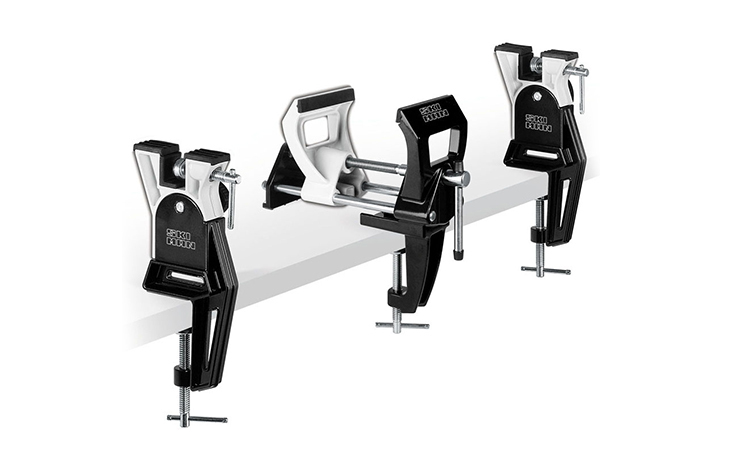 So, question for @SlideWright, could these be mounted directly to a wooden bench without the use of C-Clamps, so I could mount it six inches or so in from the edge of the bench?